The predominant thrust of my research concerns host-parasite interactions in bivalve molluscs. A second focus aims to enhance our understanding of the ecological impact of bivalves, particularly the eastern oyster, at the population, community and ecosystem levels. • Project PORTS (Promoting Oyster Restoration Through Schools). 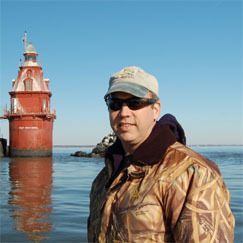 • Delaware Bay New Jersey Oyster Stock Assessment. Munroe, D., A. Tabatabai, I. Burt, D. Bushek, E. N.Powell & J. Wilkin. 2013. Oyster mortality in Delaware Bay: Impacts and recovery from Hurricane Irene and Tropical Storm Lee. Estuarine, Coastal and Shelf Science. 135:209-219. Ford, S.E. and D. Bushek. 2012. Development of resistance to an introduced marine pathogen by a native host. J. Mar. Res. 70:205-223. Bushek, D., S.E. Ford and I. Burt. 2012. Long-term patterns of an estuarine pathogen along a salinity gradient. J. Mar. Res. 70:225-251. Ford, S E., E. Scarpa, D. Bushek. 2012. Spatial and temporal variability of disease refuges in an estuary: Implications for the development of resistance. J. Mar. Res. 70:253-277. Wang, Z., D. Haidvogel, D. Bushek, S. Ford, E. Hoffman, E. Powell and J. Wilkins. 2012. 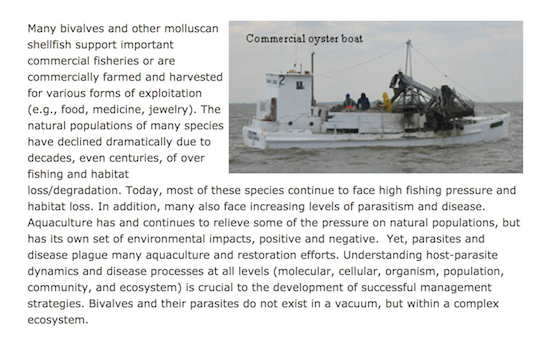 Circulation and water properties and their relationship to the oyster disease, MSX, in Delaware Bay. J. Mar. Res. 70:279-308. He, Y., S. Ford, D. Bushek, E. Powell, Z. Bao and X. Guo. 2012. Effective population sizes of eastern oyster Crassostrea virginica (Gmelin) populations in Delaware Bay, USA. J. Mar. Res. 70:357-379. Powell, E.N., J.M.Klinck, X. Guo, E.E.Hofmann, S.E.Ford, D. Bushek. 2012. Can oysters Crassostrea virginica develop resistance to Dermo Disease in the field: The impediment posed by climate change. J. Mar. Res. 70:309-355. Ford, S.E., J. Paterno, E. Scarpa, N. A. Stokes, Y. Kim, E.N. Powell, D. Bushek. 2011. Widespread survey finds no evidence of Haplosporidium nelsoni (MSX) in Gulf of Mexico oysters. Dis. Aquat. Org. 93:251-256. Kraeuter, J.N., S. E. Ford, D. Bushek, W. C. Walton, D. C. Murphy, G. Flimlin and G. Mathis. 2011. Evaluation of three hard clam, Mercenaria mercenaria (Linne), strains grown in Massachusetts and New Jersey for QPX-resistance. J. Shellfish Res. 30:805-812. Powell, E.N., J. Klink, X. Guo, E. Hofmann, S.E. Ford and D. Bushek. 2011. The potential for oysters, Crassostrea virginica to develop resistance to Dermo disease in the field: Evaluation using a gene-based population dynamics model. J. Shellfish Res., 30(3):685-712. Ford, S.E., J. Paterno, E. Scarpa, Y. Kim, E.N. Powell and D. Bushek. 2011. Widespread survey finds no evidence of Haplosporidium nelsoni (MSX) in Gulf of Mexico oysters. Dis. Aquat. Org. 93: 251–256. Wang S., E. Peatman, H. Liu, D. Bushek, S.E. Ford, H. Kucuktas, .J Quilang, P. Li, R. Wallace, Y. Wang, X. Guo, Z. Liu. 2010. Microarray analysis of gene expression in eastern oyster (Crassostrea virginica) reveals a novel combination of antimicrobial and oxidative stress host responses after dermo (Perkinsus marinus) challenge. Fish and Shellfish Immunol., 29(6):921-9. Hofmann, E., D. Bushek, S. Ford, X. Guo, D. Haidvogel, D. Hedgecock, J. Klinck, C. Milbury, D. Narvaez, E. Powell, Y. Wang, Z. Wang, J. Wilkin, L. Zhang. 2009. Understanding How Disease and Environment Combine to Structure Resistance in Estuarine Bivalve Populations. Oceanography 22(12):212-231. Ford, S., N. Stokes, E. Burreson, E. Scarpa, R. Carnegie, J. Kraeuter and D. Bushek. 2009. Minchinia mercenariae n sp., a parasite of the hard clam Mercenaria mercenaria. J. Eukaryot. Microbiol., 56(6):542–551. Gray, B. R., D. Bushek, J. W. Drane and D. Porter. 2009. Associations between land use and Perkinsus marinus infection of eastern oysters in a high salinity, partially urbanized estuary. Ecotoxicology, 18:259-269. Powell, E.N., J. Kraeuter, K. Ashton-Alcox, S.E. Ford and D. Bushek. 2008. Long-term trends in oyster population dynamics in Delaware Bay: Regime shifts and response to disease. J. Shellfish Res. 27(4): 729-755. Taylor, J. and D. Bushek. 2008. Intertidal oyster reefs can persist and function in a temperate North American Atlantic estuary. Mar. Ecol. Prog. Ser. 361:301-306. Richards, G.P., M.A. Watson, E.J. Crane, I.G. Burt, and D. Bushek. 2008. Shewanella and Photobacterium in oysters and seawater from the Delaware Bay. Appl. Env. Micro. 74(11):3323-3327. Bushek, D., B.Landau and E. Scarpa. 2008. Perkinsus chesapeaki in stout razor clams Tagelus pleius from Delware Bay. Dis. Aquat. Org. 78: 243-247. Bushek, D., A. Kornbluh, H. Wang, X. Guo, G. DeBrosse and J. Quinlan. 2008. Fertilization interference between Crassostrea ariakensis and Crassostrea virginica: a gamete sink? J. Shellfish Res. 27(3): 593-600. Bushek D., M. Heidenreich and D. Porter. 2007. The effects of several common anthropogenic contaminants on proliferation of the parasitic oyster pathogen Perkinsus marinus. Mar. Env. Res. 64:535-540. Allen, D.M., S.S. Haertel-Borer, B.J. Milan, D. Bushek and R.D. Dame. 2007. Geomorphological determinants of nekton use in intertidal salt marsh creeks. Mar. Ecol. Prog. Ser., 329:57-71. Ellin, R. and D. Bushek. 2006 Adaptation of Ray’s fluid thioglycollate medium assay to detect and quantify planktonic stages of Perkinsus parasites. J. Shellfish Res. 25(3):1037-1042. Bushek, D. and S. Boyd. 2006. Seasonal Abundance and Occurrence of the Asian Isopod Synidotea laevidorsalis in Delaware Bay, USA. Biological Invasions, 8(4):697-702. Toline, C.A., P. Kenny and D. Bushek. 2005. 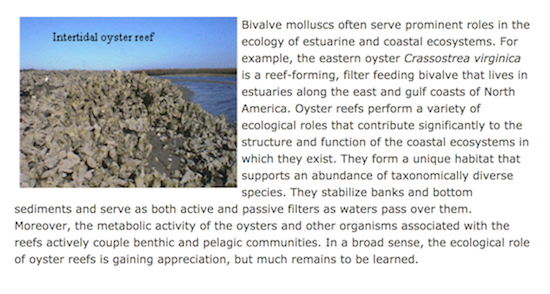 Cement-coated stakes enhance recruitment of damaged oyster reefs (South Carolina). Ecological Restoration, 23(4):277-288. Bushek, D. and D.M. Allen. 2005. Motile suspension feeders in estuarine and marine ecosystems. In: The Comparative Role of Suspension Feeders in Ecosystems, RF Dame and S Olenin (eds), NATO Science Series: IV – Earth and Environmental Sciences, Vol. 47. Springer, Dordrecht, The Netherlands. pp 53-71. Bushek, D., D Richardson, M.Y. Bobo and L.D. Coen. 2004. Short-Term Shell Pile Quarantine Reduces the Abundance of Perkinsus marinus Remaining in Tissues Attached to Oyster Shell. J. Shellfish Res., 23(2):369-373. Can elemental signatures from larval shells reveal source populations of settling oyster larvae? Trophic dynamics involved in transmission of the estuarine oyster pathogen, Perkinsus marinus. NSF REU Project: Using ribbed mussels to quantify transmission of Perkinsus marinus. Do Size-specific Gender Differences Exist in Oysters Parasitized by Perkinsus marinus?